This weekend I will be attempting to replace the radius arms on my 1995 RWD (the bushings are failing and one arm has a rust hole). Based on past experience, I imagine that the long bolts that go through the beam, arm, and spring retainer (with 2 nuts) will be rusted away and may need to cut off (if I can't get it with a wrench and socket/breaker bar and a MAPP torch). However, outside of some overpriced part kits on ebay (with arms), I can't find replacement hardware anywhere nor can I find a size/spec. I'd like to have the parts in-hand before I begin the work. Also, I'm on the road for work (in a rental van) so I can't measure it right now. If somebody could tell me the sizes of said hardware (Class 10/ grade 8, I know), that would be great. 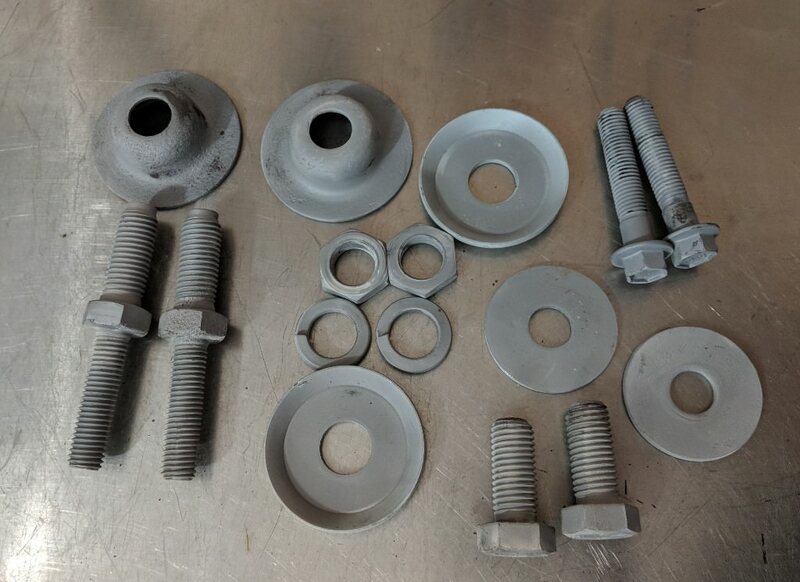 Or somebody selling the bolts and nuts as a kit that I can order. EDIT: My bad. RWD is different and only uses one long bolt. Sorry I am of no help. The following is for the 4x4 beams/radius arms. 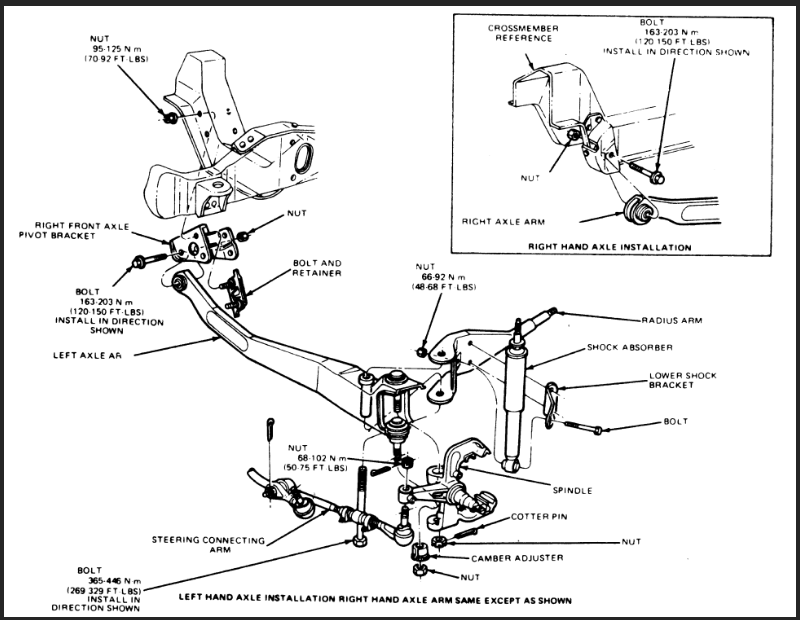 The top bolt is a two part bolt; the radius arm is bolted down with the 3/4-10 part, and the coil spring uses the 5/8 - 11 part. The lower beam bolt is just a regular 3/4-10 bolt. Be ready, because they're expensive. I sourced some grade #8 on Ebay for cheaper than Ford wanted for theirs. I'm not 100% on these being correct but some additional research should confirm it quite easily. Yikes. $27 for one bolt. You'll probably have better luck pulling the bolt out and going into Fastenal or ACE Hardware and getting one of similar length. I've never pulled one out that was actually bad. If you squirt them enough, several times, a few days prior to removal, you shouldn't have any problems. You live in a similar location to me as far as rust and salted roads, etc. If it's not a pressing issue, I may have a couple spares here in a few days. I'm doing a beam swap right now. I'll look into it. On my last ranger one was fine while the other was a pile of powdered rust under the spring "cup".